Hibs wrapped up their preparations for the new season with a comfortable 4-1 victory over Shrewsbury Town in what was the Edinburgh club’s first ever visit to Shropshire. Headers from Liam Fontaine and Grant Holt put Hibs in the driving seat at Greenhous Meadow – the local car dealer being the sponsor of Micky Mellon’s side – and although Jim O’Brien pulled one back, Hibs motored on with further strikes from Jason Cummings and James Keatings. Although the acid test will, of course, come in Saturday’s opening Championship match against Falkirk, head coach Neil Lennon will undoubtedly be happy with how things have gone, 16 goals scored in five warm-up games to add to those two notable performances in the Europa League against Brondby. Lennon, as he has done throughout recent weeks, again made a string of changes for Hibs’ final pre-season match, six in total from the side which defeated Birmingham City seven days earlier. 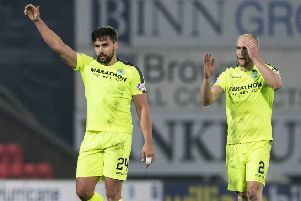 But having been impressed by his players’ performance, particularly in the second half of that game against English Championship opposition, the Hibs head coach was nodding his approval as he watched the Capital club race into a two goal lead within six minutes. Fontaine inflicted the first blow, rising above everyone to meet Keatings’ free-kick, his header going in off the underside of goalkeeper Jayson Leutwiler’s cross bar before Holt – known as Superman when he plied his trade in these parts, 28 goals in 52 matches for Shrewsbury over the course of one season earning him that moniker – added a second in double quick time. At 35, Holt can decidedly be described as a veteran – no doubt he’d prefer the description experienced – but no matter, he used it all to find space to stoop and nod Scott Martin’s low cross beyond Leutwiler and into the corner of his net. Shrewsbury were clearly stunned, the League One side attempting to hit back with a powerfully-struck volley from Louis Dodds, but Ross Laidlaw, well aware this would probably be his last chance to catch Lennon’s eye ahead of the expected arrival of Israeli internationalist goalkeeper Ofir Marciano, made sure he got everything behind it. “Pass, pass, move it, work it,” were the exhortations being barked from the away dugout, Lennon and his assistant Garry Parker determined their players made full use of these final 90 minutes before their Championship campaign gets underway at Falkirk on Saturday. Shrewsbury’s own season begins then, but boss Mellon have been a tad concerned at the opening 20 minutes of this game, Darren McGregor powering in a downward header from Keatings which reared up off the turf and had to be tipped over by Leutwiler before the goalkeeper had to beat away a rising Jason Cummings effort. The Salops had struggled to make much of an impact, but attempted to do so as Shaun Whalley delivered a deep cross, Junior Brown rising at the far post only to find his path blocked by McGregor before Laidlaw faced his first serious test. Arms were raised in a vain call for offside as Dodds latched onto a ball launched from Olly Lancashire deep inside his own half but Laidlaw stayed big, spreading his 6ft 5in frame to make an impressive block. However, the Shrewsbury backline, with former Hibs players Ryan McGivern one of their two central defenders, looked less than certain when the ball was in the air and Fontaine was only inches away from making contact with another Keatings free-kick whipped in from the left. Even so, Hibs had dropped the pace somewhat after that blistering start and Lennon was soon on the touchline displaying his annoyance, the immediate effect being a tempting cross from Alex Harris which McGivern, at full stretch, met at his own front post, turning the ball just inches wide. But Shrewsbury pulled one back through former Dunfermline and Motherwell man O’Brien, the midfielder stepping up after McGregor, playing at right back, had upended Brown 22 yards out, his free-kick taking the slightest of deflections to carry the ball wide of Laidlaw’s outstretched left hand. Shrewsbury’s hopes of getting an equaliser vanished, though, within five minutes, ex-Easter Road midfielder Gary Deegan slipping 25 yards out to gift Cummings possession, the 20-year-old taking full advantage as he ran on unimpeded to slot the ball past the helpless Leutwiler. And two minutes later it was four for Hibs, Keatings at full stretch managing to get enough to loft it over Leutwiler, who got a touch to the ball but couldn’t stop it looping into the top corner of his net, much to the delight of the 469 fans from the Capital behind that goal. Despite missing figures such as David Gray, Dylan McGeouch, Fraser Fyvie and Marvin Bartley, Lennon was again able to display the versatility of his squad as he began making a raft of changes halfway through the second half. McGregor moved into central defence alongside Fontaine as Jordon Forster made an appearance, Paul Hanlon stepping forward to take up that holding role in midfield while Keatings moved up to partner Cummings with Harris taking up position in that hole behind the front two as Martin Boyle took up station wide on the right. Two minutes later the swaps were more straightforward, Callum Crane taking over at left back from Lewis Stevenson, while Sam Stanton replaced Martin in central defence before Keatings made way for Dan Carmichael. Lennon’s decision to switch Hanlon to the middle of the park has drawn much comment, but while the 26-year-old has developed into an accomplished defender, it was in that area of the pitch where he once played for Hutchie Vale, scoring more than a few goals in the process. And he showed he hasn’t lost that knack, curling in a shot from distance which left Leutwiler stranded but drifted just wide of target. That was to be the end of the action as Hibs ended their pre-season campaign with a commanding victory. Shrewsbury Town: Leutwiler, Riley, Brown, Deegan, Lancashire, McGivern, Whalley (Jones 53), Ogogo, Leitch-Smith, Dodds, O’Brien. Substitutes not used: Mangan, Burton, Black, Grogan, Sadler, El-Abd. Hibs: Laidlaw, McGregor, Hanlon, Fontaine, Harris, Martin (Stanton 71), McGinn (Forster 67), Stevenson (Crane 71), Keatings (Carmichael 73), Cummings (Shaw 80), Holt (Boyle 67). Substitutes not used: Virtanen.